To quote the erstwhile Pooh, today is a great big blustery day! Cold, chill, the type of wind that just makes you feel like you could spread your wings and be lifted aloft. But last night, on my 56-step commute from my house to my studio, it was still warmish (for April) and calm. And I heard the true, sure sign that spring is here—peepers. We have a lot of wonderful wildlife that shares our riverside abode and a little later in the season, we’ll be nearly deafened (in a nice way) by singing toads. 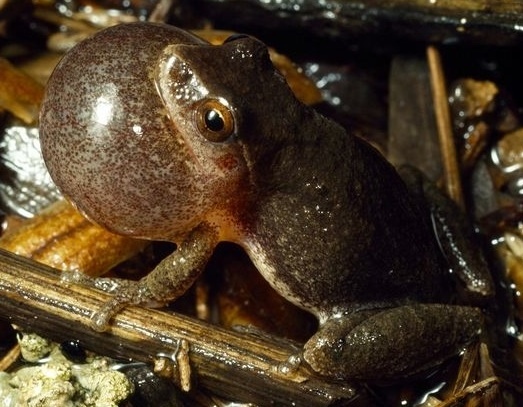 But peepers, they’re kinda the new amphibian on the block around here. Though I can’t prove it, I believe these little mites are immigrants who washed up on our stretch of the river after Hurricane Irene. They share a love of the same environment as the toads—shallow, protected waters with ample plant life and mud for wallowing so it’s not surprising that they hung out after that storm. When I was a little girl, there was a swampy area behind our house, bordered by a small field and the railroad tracks. During the spring, we fell asleep to the music of peepers, a sound I grew to love as a child. So when I stepped outside my door and heard that choir, I stopped to breathe in the earthy aroma of the land in a sprinkling rain and listen until I was ten again.